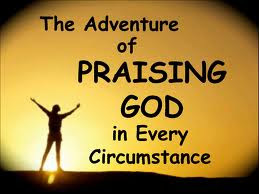 It is truly good to praise the Lord. Praising God feels good I tell you. You would think I just had an epiphany or something, but I guess you can call it a renewal of spirit. This is one of those random moments that occurs and brings about something new in your life. Okay, what I'm I talking about you ask? Well I was in the shower last night and hubby was also in the bathroom shaving his beard. I am not one to sing in the shower for any reason. In fact I like the quietness and just the sound and feel of the water. But on this night, out of no where I broke out in a song and started singing. On the second or third line, I heard hubby's voice joining in and that was how we started a little praise and worship session while I was showering and he was shaving. I was feeling the moment and to savor it more I stayed longer in the shower than I would have and by the time I shut off the water and ended the session some few minutes after. I can honestly say I felt refreshed and renewed in my faith, like anything is possible at that moment. That moment of randomness has turn into something we've agreed to do more often now. Saying your prayers is all good, but sometimes all God wants is our praise. There is truly power in praising God. I know what you mean! I have this Nigerian praise and worship CD that I have been listening to in my car every single day for the past month. There is this indescribable feeling I have when I am listening to it. Sometimes I listen quietly, sometimes I sing at the top of lungs(lol), sometimes I cry and other times I laugh regardless of the situation I feel so close to God and happy. I really enjoyed reading this post and may God continue to teach us how to praise Him in advance, Amen.